Basswoods are often planted as an ornamental tree along city streets. Things that are important often have more than one name. The basswood tree has a number of names, in part derived from how the tree is used and in part derived from other languages. Each name provides a different emphasis or connotation. The name “basswood” refers to the tree as a source of bast, the flexible inner bark used as a fibre for matting. The same tree was once called “teil”, now “tilleul”. This name also describes the pale yellow-green colour of the flowers and bracts that make a popular tea, especially in France. An effective darning stitch, called “gris-tilleul”, reflects the shape of the flowers and bracts. There are around thirty species growing in temperate climates. 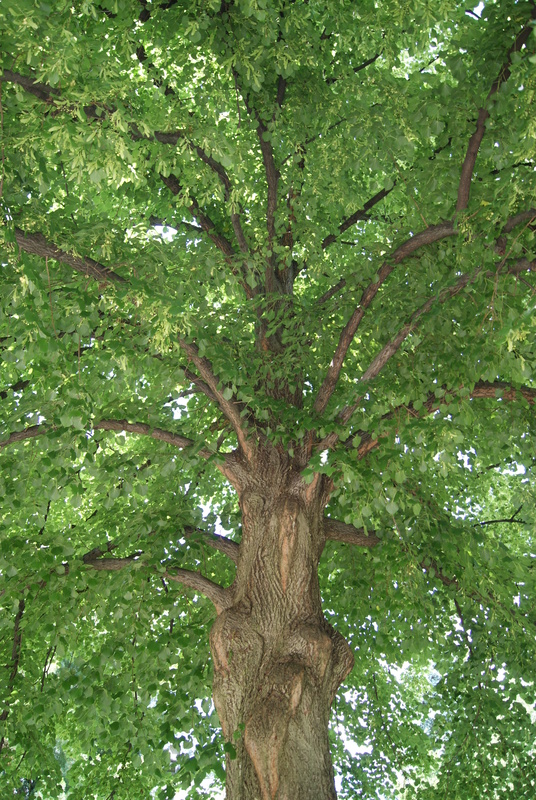 The scientific name, genus Tilia, derives from the old name for tree, “teil”. Two common species are Tilia americana and T. europaea. In England, the tree is called a “lime tree”, although it is in no way related to the citrus lime tree. “Linden” was originally an adjective meaning “made from lime wood”. The wood itself is soft and easy to carve, unlike many other deciduous trees. Now linden is another name for the basswood tree. Later on we will discuss synonyms, different terms used to describe similar things.